Alvexo Review & Complaints 2019 - Safe or Scam? Demo? App? Fees? Alvexo is a global financial firm that provides forex and CFD trading opportunities to customers in Europe and elsewhere. This is a MetaTrader 4 broker meaning they offer the MT4 trading platform which provides maximal functionality and other great benefits. Lately, Alvexo has dedicated a lot of their product to cryptocurrency trading, and it’s currently one of the most popular asset classes for the broker. However, Alvexo also provides access to a range of other financial instruments and investment opportunities. 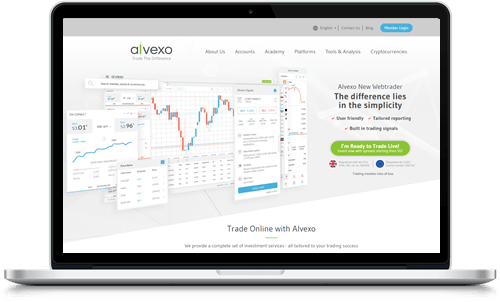 Alvexo is an established and respected broker in the forex and CFD sphere and a great option for anyone looking to invest in some of the world’s most popular markets. In today's forex and CFD market, there are two types of brokers. There are some that developed their own tools and that strive to have the most advanced platforms available, and there are brokers that focus on simplicity and functionality. Alvexo belongs to the latter group and we love it. By offering access to the MetaTrader 4 platform and a range of the most popular financial instruments, traders know what to expect even before they sign up. Also, you have four different accounts to choose between as well as an Alvexo demo account and there is definitely a setup that suits you perfectly. In order to qualify for a recommendation from us, a broker needs to be regulated. Being regulated and authorized by a recognized financial agency means your information and your funds are protected. It also means that the broker gets audited regularly and that every part of their business is overseen and evaluated. In this case, Alvexo has a license from the Cyprus Securities and Exchange Commission (CySEC) which happens to be the leading regulatory agency in Europe. In other words, Alvexo is fully regulated, safe to use, and definitely not a scam. When it comes to trading platforms, CFD and forex brokers like Alvexo have two options. They can either spend the time and resources needed to develop their own trading platform with all the necessary tools and features, or they can offer a third party platform. Developing their own platform has some benefits but it is a costly process, and in many cases, the user-experience on proprietary platforms is subpar. Because of that, most brokers opt to offer a third-party platform which is exactly what Alvexo has done. When signing up for an Alvexo trading account, you’ll get access to the most popular trading platform in the industry, the MetaTrader 4. Not only is this the most popular trading platform but in our opinion, it’s also one of the absolute best ones on the market especially for forex trading. In addition to the downloadable MetaTrader 4 platform, Alvexo offers web trading in a dedicated web trading platform. Web trading is somewhat limited compared to desktop trading, but it’s more than enough for most traders. In order to stay competitive in today’s industry, a broker needs to offer mobile trading, and all brokers that work with the MetaTrader 4 also offer the MetaTrader mobile trading app. Alvexo’s mobile trading app is available for Android and iOS as well as certain Windows mobile devices. That means that you can bring Alvexo with you wherever you go. Which Instruments Can You Trade with Alvexo? Alvexo offers a range of currency pairs and CFDs to invest in. For example, you can trade the leading currency pairs in the world, certain stocks from the United States and Europe, commodities, bonds, and more. Lately, Alvexo has also started offering cryptocurrency trading which means you can benefit from one of the fastest growing markets on the planet. Note that Alvexo offers different accounts (see below) depending on what you are interested in investing in and we encourage you to read up on the different accounts and assets before you start trading. Today, Alvexo offers four account types with very specific features and tools. The first account is called the Classic Account. This has been designed to fit most traders and comes with basic trading opportunities. Most people that open a classic account with Alvexo are beginners. Minimum first deposit of $500. The Gold Account is Alvexo’s most popular trading account. It has the same features as the classic account but with several upgrades such as better market updates, personal customer support, and optimized trading conditions. Minimum first deposit of $2,500. The ECN Account is another popular account that allows for direct trading. Compared to the two first accounts, the ECN account has more competitive spreads and other perks such as personal account managers. This account is great for stock trading. Minimum first deposit of $5,000. The Prime account is an account developed with professional traders in mind. This account was developed to offer the most efficient trading experience possible with amazing analytic abilities and state of the art price alerts. Minimum first deposit of $10,000. You also have the option of opening an Alvexo demo account to practice trading in a risk-free environment. The Alvexo demo account comes with 50,000 virtual dollars, free trading signals, and real-time market prices. We are big supporters of demo accounts and encourage all of our readers to at least consider opening one, especially if you are a beginner that has never traded forex or CFDs before. One of the biggest drawbacks with Alvexo is the lack of available payment methods. Your only options are to fund your account with a credit or debit card, a regular bank transfer or CashU. There are no online payment services such as Skrill, Neteller or Paypal available. If you ever have any questions or run into an issue, you can opt to contact Alvexo using the following methods. Call Alvexo: +357-250-30482 (Cyprus main office), +44-2037699390 (United Kingdom) plus a handful of local phone numbers. In addition to those two contact channels, you can request a call back from the broker at a time that you set up yourself. Note that registered clients have access to more contact methods and with the prime and ECN account you get access to your own account manager. Alvexo is a pretty good CFD and forex broker that provides trading opportunities for most people. They also offer adequate leverage, good trading platforms, and more. However, their spreads are higher than the industry standard, payment options are quite limited, and we wish we could contact the support team via a live chat. All in all, Alvexo is a regulated broker that we feel comfortable recommending to both beginners and more experienced traders.